In the past two days, I have worked with two dogs injured from overzealous ball playing, fetching, retrieving at quick paces, or whatever you want to call it. When I mentioned to both owners they would need to discontinue this activity for a while to let the dog heal, they both responded in despair with questions of how would they be able to exercise or tire out their energetic dog. And there were also interjections of how much the dog loves to play with the ball and disc. The fact that their dog was injured did not appear to be a concern. The real concern was how impossible it would be to stop doing this activity. It occurred to me that many people feel this strong NEED to continuously throw a ball or other object for their dog, have them retrieve it, and repeat until the dog almost drops from exhaustion. Nothing seems to deter people from doing this – not even lameness. In both the recent dogs I worked with, the owners admitted the ball throwing in their yard caused the lameness and pain. However, they could not give it up, even though it was hurting their dog physically because the psychological stress to the dog and owner would be too much. I look at things from a physical standpoint first and adhere to the rule of causing no harm. So, for me, this is a no brainer type of thing to deal with. There are many behaviors that can be used to replace ball playing and many types of activities and exercise that can be used safely to ‘tire’ the dog out. So, I am just going to go out there on a limb and publically state – I hate this exercise and in my opinion, it is the cause of more injuries to dogs who are not fit than any canine sport out there! Let’s first look at the breakdown of a short retrieve. And by this, I mean tossing a ball or other object repetitively. The take off to retrieve the ball is an explosive movement. 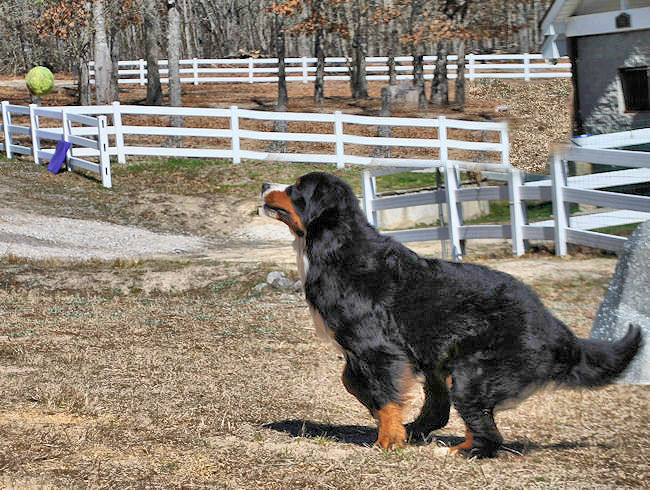 Many muscles are working to propel the dog forward, inclusive of the core and hindlimbs. Basically, the entire body works to move the dog forward quickly. 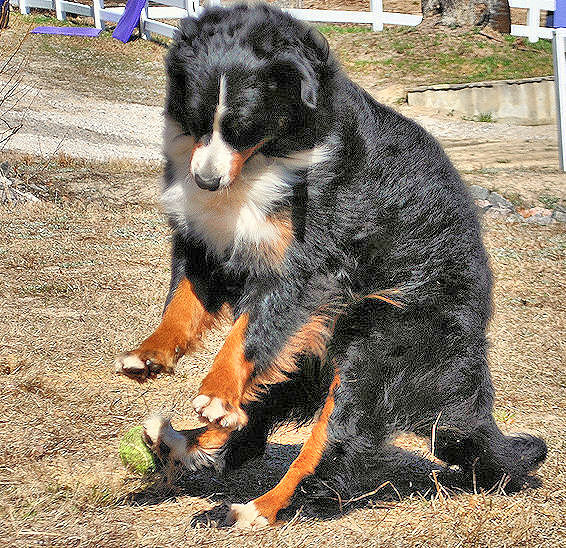 The dog is focused on the movement of the ball and direction changes, rather than its own safe movement. Then comes the real stress of this motion — slowing down to grab the ball. The dog must use its muscles eccentrically to put the brakes on and grab the ball. The large muscles of the hips, shoulder and trunk need to work very hard to slow the dogs’ body down so it can safely and effectively pick up the ball. If the dog does not have the strength to do this, we often see it wipe out completely and fall on its face or we watch the hindlimbs dangerously move in front of the dogs’ body. Of course, we see this more often as the number of repetitions continues. The more fatigued the dog becomes, the less control they have over body movement. Injuries can occur to the dog’s shoulders if the forelimbs slip while they are running full out with their heads in the air. Injuries to the iliopsoas and the lower back are also very common due to the lack of control of forward motion. Injuries to the spine may also occur, and of course, additional soft tissue injuries to the face, toes, wrists and hock. Unfortunately, this type of activity is very often performed without a warm up. I hear countless stories of owners who take their dog out in the morning, stand on their back porch and throw a ball ten to fifty times to help decrease its energy. There are many alternatives to this exercise, and I am sure your dog will love them. Core work can burn more energy than playing fetch. While drinking your morning coffee, ask your dog to perform sit-to-stands on the K9 Kore Disk. Repeating this until the dog is tired will focus on both their strength and their training. Of course, this can be done any time throughout the day because it’s easy to incorporate into normal household routines. Teaching your dog to back up onto and over the Disk, BISkit or another object will also work their core and their hind end awareness. If your dog is able, you can add in side-stepping on and off an object. Walking with exercise intervals is one of my favorite activities. If you only have ten minutes, taking your dog out for a ten-minute walk and breaking it up with intervals is a wonderful way to mentally and physically stimulate it. Bring a stop watch or set your phone and begin with a one minute fast walk. After a minute, ask your dog to perform ten sit-to-stands. Then continue for another fast minute walk. Then ask your dog for stand-to-sit-to-downs, and reverse. You can continue with this and add in walking backwards, side steps, etc. Both the mental and physical stimulation is a great way to exercise your dog. Begin with slow and controlled ball playing. Start with short distances and a small number of reps. Always keep the throwing low and controlled. Do not do this on a slippery surface – such as wet grass, ice or snow. If your dog is exhibiting signs of lameness during the activity or after, STOP!! Thank you so much for this info! Our choc lab is ball obsessed and we go back and forth with this. I do worry about injury especially since he kicks it into full gear. Will revise our exercise program. I have a 7.5 yr. old Pembroke Welsh Corgi with arthritis in her left front leg elbow. She is on Meloxicam. Would the fast walk, sit-stand and stand-to-down (and reverse) exercises aggravate her elbow? We do agility and focus training with her but we keep it low and slow and also for short periods while watching her for signs of stress indicating the start of inflammation. Thank you for this interesting article. Hi, Barb — it’s best to ask the veterinarian you are working with about whether these exercises would be appropriate for your dog. Lately, I have read articles regarding owners that push their dogs in agility trials. Vets are seeing more and more injuries that are happening to these dogs. The weaving and jumping is very hard on their joints, muscles, and tendons. They are starting these dogs at a very young age before their bodies have been given a chance to mature. When the dog stops limping they are back on the field, that doesn’t mean they are thoroughly healed. What’s sad is the dog doesn’t care about the ribbons it’s the owner that wants the acknowledgments and the wall full of ribbons. It’s always the same response “they love what they do”. In my opinion they would love going on a nice long walk or practicing obedience training. Would you be happy for me to post this on my website, as it is so important that people understand that ball throwing is not the only way to exercise and that there are much safer options? Absolutely, Jane. Go ahead and thanks for asking. I must admit that I am one of “Those people” who thought they were doing the right thing by just playing fetch in the back yard for my dogs. I had no knowledge of other ways to exercise them and tire them out. My dogs have indeed suffered injuries but I did not link them to the ball playing in my back yard–until now. With this winter already being one of the wettest ones in our state’s history, I was forced into searching for some other ways to exercise my dogs because our backyard is a mid pit and swamp area. I felt so guilty by not allowing them to go out in the backyard and play ball with them. My guilt ran so deeply that I was convinced I was not being a very good dog owner, which in turn caused depression. Happily, through Fenzi, I have discovered you all and you have restored hope for me. I cannot wait for the upcoming class in February to begin working with my dogs! Thank you so very much for speaking out here and in January’s Dogs Naturally Magazine! I no longer feel the guilt and am focusing on starting a conditioning program individually tailored to each of my dogs’ specific needs. Thank you so very much!!!! !